Immunoglobulins are a group of serum proteins found in the blood and are commonly known as “antibodies”. There are five major classes of immunoglobulins called IgM, IgG, IgA, IgE and IgD. IgG and IgM are the immunoglobulins associated with responses to infectious agents, foreign proteins and protective antibodies. IgE is an immunoglobulin associated with allergic responses and IgD appears to be associated with skin allergic responses. IgA is the major immunoglobulin in the external secretions of the dog and is found in the saliva, tears, and mucous secretions . It is of critical importance in protecting the intestinal, respiratory, urinary, and reproductive tracts of the dog – it is the first line of defense in protecting the body from infection. Its most important mode of action is to prevent the attachment of bacteria and viruses to epithelial surfaces exposed to the environment. Beginning in 1984, articles began to appear in the veterinary literature documenting selective IgA deficiencies in the German Shepherd1, and in a colony of Beagles2. This deficiency has been known in humans for a long time, although the mode of inheritance has yet to be worked out. In the Beagle colony, IgA deficiency manifested as recurrent upper respiratory infections, recurrent ear infections, recurrent parvoviral enteritis and recurrent, chronic skin infections. 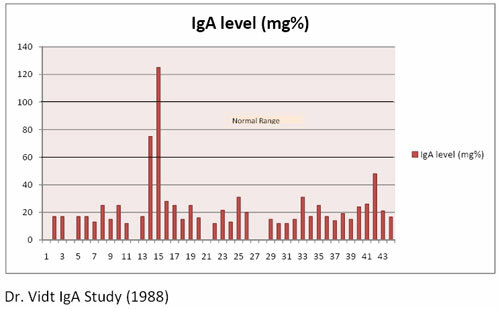 The only immunologic defect found was a marked IgA deficiency. Furthermore, this IgA deficiency appeared to be an inherited defect. In 1986, an article appeared describing an IgA deficiency in the Chinese Shar-Pei3. The report concerned two Shar-Pei puppies with signs of sinopulmonary disease – bacterial nasal infections and pneumonia. Both puppies had markedly low IgA levels. The report also went on to discuss that 30 of 39 (76.9%) of clinically normal adults in two colonies of Shar-Pei had deficient IgA levels. This percentage agrees with the results of other labs studying IgA levels in the Shar-Pei. In 1988 I did an IgA study in Shar-Pei. 43 Shar-Pei participated in the study. There were 17 males and 26 females. The average age of the dogs was 30 months of age and the average serum IgA level was 21.8mg% — normal range for IgA was 60-100mg%. There were two dogs with normal levels and 5 dogs with basically no IgA levels. In this study 95% of the dogs were IgA deficient and 11.5% had no IgA levels. 17 dogs in the study had current or past clinical problems which may have been attributable to IgA deficiency such as skin disease, seizures, urinary and gastrointestinal disease. This data also indicates that many Shar-Pei with selective IgA deficiency are clinically normal. There is no treatment for IgA deficiency itself but it is important to treat the clinical signs associated with the condition. I also don’t recommend assessing IgA levels in every Shar-Pei although in chronically ill dogs it would be prudent to do so. I will also say in a couple of the dogs in the above study, IgA levels increased during illness which indicates many of these dogs can generate an appropriate response when challenged. TJ Whitbread, RM Batt, G Garthwaite, 1984. Relative Deficiency of Serum IgA in the German Shepherd Dog: A Breed Abnormality. Res in Vet Science 37:350-352. PJ Felsburg, LT Glickman, PF Jezyk, 1985. Selective IgA Deficiency in the Dog. Clin Immunol and Immunopath 36:297-305. SD Moroff, AI Hurvitz, ME Peterson, L Saunders, KE Noone, 1986. IgA Deficiency in Shar-Pei Dogs. Vet Immunol and Immunopath 13:181-188.